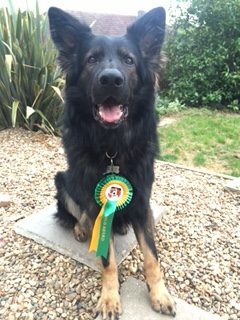 Our beautiful German Shepherd Breguet has achieved his Kennel Club Good Citizen Dog Scheme GOLD award, this is the highest level of achievement. The exercises include: a road walk, return to handler’s side, walk free beside handler, stay down in one place (two minutes both in and out of sight), send to bed, stop the dog, relaxed isolation, food manners, examination of the dog, responsibility and care questions for handlers. We are extremely proud of our super social Breguet, he proves time after time how he can deal with any situation and is an extremely sociable dog even with his high level of protection training in place. He can often be seen when we are taking classes laying down and watching all the dogs and owners participating. At home Breguet loves our other dogs and is as quiet as a mouse unless the door bell goes that is! 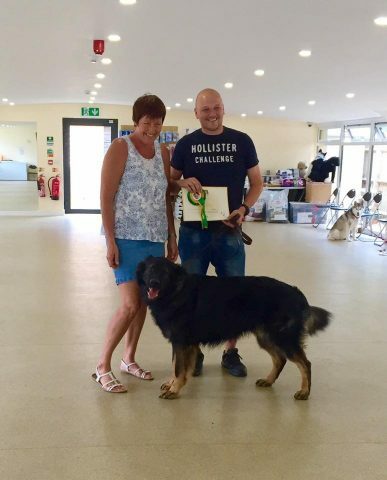 Kennel Club Good Citizen Scheme Award CHAMPIONS!